Hello, this is my first review of any kind here, I hope it's alright. Redbubble is a website where independent artists can upload their work and have it sold on t-shirts, bags, prints, phone cases, and various other things. You can find both fan-art and original art there. Of interest to me was their spiral notebooks. 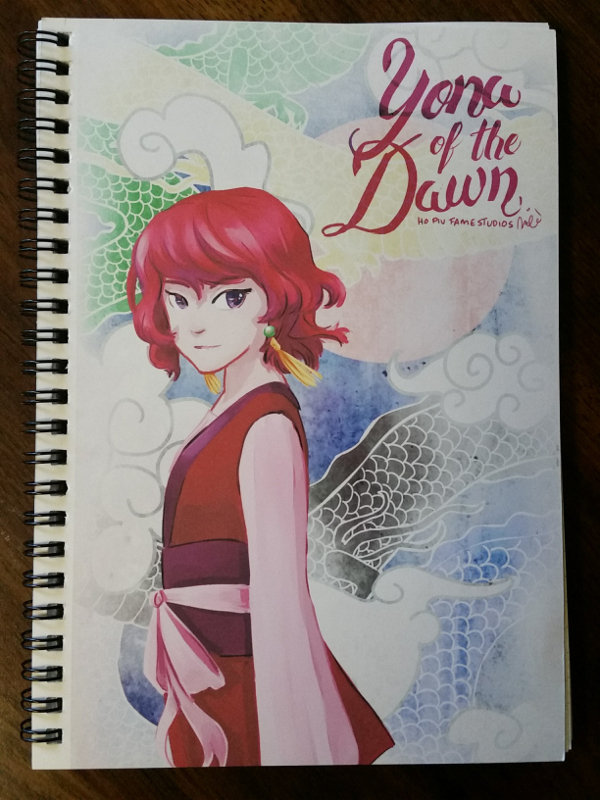 I wasn't expecting much since this is not a company that specializes in paper and writing products, but a couple of my friends sell art there, so I decided to check them out. 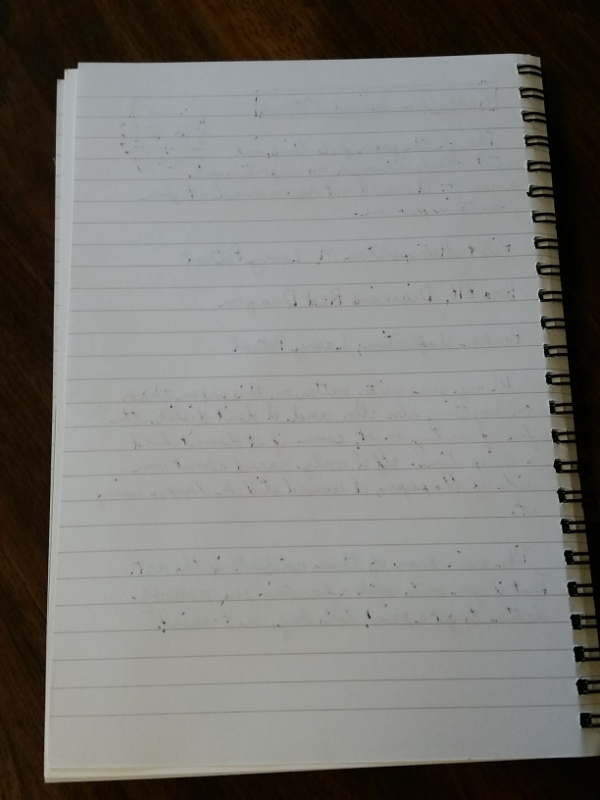 The only info given about the notebook's paper was that it's 90gsm and came in a choice of ruled or graph paper. The notebooks are 6" x 8" and have a page with a pocket in the back. This particular cover happens to be fan-art from my favorite manga series. The cover was a slight disappointment. I assumed it would be printed on glossy paper (though in retrospect, I'm not sure why I assumed this), but it's matte. Still, the image is bright, crisp, and clear, so it's not a big disappointment. It is...I'm not sure the technical term. Very thirsty paper. There's some feathering, and the line is consistently dark, no shading to speak of. The paper has a noticeable tooth but does not feel too rough when writing. I actually really like the feel of writing on it, I'm just not fond of the result. Lots. You could write on both sides and I think it would still be legible, but I wouldn't want to. 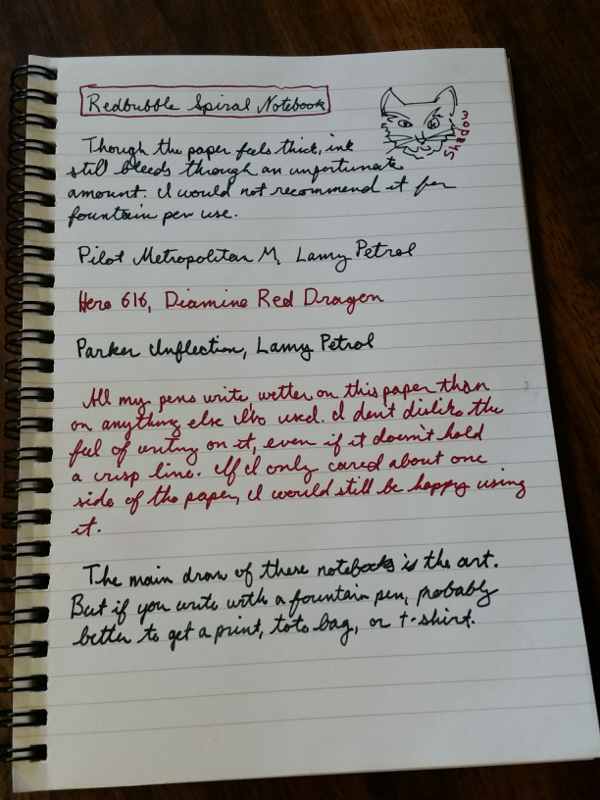 Redbubble's notebooks may be of interest to people for the novelty of the cover artwork, but they are not fountain-pen friendly. If you like a piece of artwork that's sold there, probably better to go with a print or one of their other products instead. Thanks for the review! Hopefully the artwork makes you happy to use the notebook even if the paper isn't ideal for fountain pens.